The original etching of Atlantis was never published. For years Norman Lindsay had been intrigued by the sunken city of Atlantis. Of all the vanished civilizations Atlantis is arguably the most contentious; scholars have debated its existence. Plato wrote two treatises about the lost island and in one, Cities, he positioned it to the west of the Pillars of Hercules (Gibraltar) on the Atlantic coast near Cadiz. German scholars as meticulous as Richard Henning have insisted that Platos description of Atlantis is based on facts. He even introduced his daughters Jane and Honey to the legend. In 1928 Rose added an amusing anecdote in a letter to Andrew Watt. Norman Lindsay is this minute giving the kids their lessons É he is giving them from the time of Atlantis. I get much fun from hearing them telling the cook and the nurse all about how it was sunk and so forth. The cook said I’ve never heard of the place. Norman Lindsay wrote a thesis on Atlantis which he published in The Scribbling of an Idle Mind. In a postscript he mentioned an exchange of letters with Leonard Cottrell, amateur archaeologist and eminent author of books on ancient civilizations. Cottrell said that archaeologists had never discovered any factual evidence of the existence of Atlantis and, therefore, he had no belief in the myth. 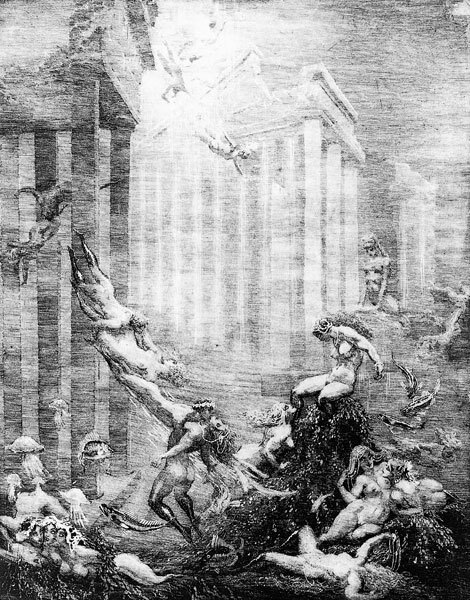 Norman Lindsay etched Atlantis in 1925 and although it is mentioned in Rose’s record book, apparently the plate failed and it remained unpublished.